We strive to have the most competitive prices and the best customer service. Please feel free to contact us directly if you have a question or concern about our products. 2.We can provide free high resolution ratio picture for the item you order . Only unused, undamaged and original condition item can be qualified for a return. Feed Back: We care about our valued buyers, Please contact us through email with any questions or concerns. We thank you for your effort to make this sale and purchase experience a happy one. Company Introduction Xinfoucs Jewelry Factory is one of the professional suppliers of body jewelry from ChinaIt is located in the beautiful coastal city of Qingdao. Our company is a manufacturer specialized in research and development of the products and selling of top class puncture jewelry. Since our products have novel styles, complete varieties, reasonable prices, superior quality and prompt delivery, they are welcomed by many customers all over the world. Pattern Pyrex glass plug and tunnel, single color plug and tunnel, printed Pyrex glass plug and tunnel. 5. Certificate: ISO 9001:2000, ISO 14001:2004 6. Many styles and various colors with different gauges &sizes waiting for your choose. 7. Our products can be customized to sample, sample and trial order are 8. Fast delivery and short delivery time. Size 6mm-25mm MOQ 100pcs(Each Color & Size) small order is acceptable if we have in stock Sample time Within 1 Week Shipping method DHL, Fedex, UPS, EMS, Etc. In the past few years, with our hard work, we have established good reputation in domestic and overseas jewelry market. We sincerely hope to establish mutual benefit business relationship with customers from all over the world with our high quality, competitive price and excellent service. If you are urgen get the price ,pls tell us in your email so that we will regard your inquiry priority. 2.How can I get a sample to check your quality 9 After price confirmation ,you can requiry for samples to check our quality . but the sample cost can be refundable after you confirmation when your quantity of the order is more about the MOQ. 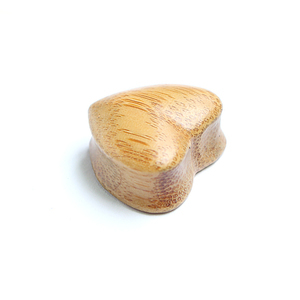 Ite m specifics: heart shape cheap wood ear plugs tapered wood ear flesh tunnel Hot sale wood ear plugs OEM color designs is ok Cheapest shipping (door to door service) Nickle and lead free is avaliable Material: wood MOQ: 100pcs one styles one color Color: wood color / wood brown / wood red / wood black Package: 10pcs/big oppbag, outer is standard carton Design: fashion, OEM design is ok Shipping: cheapest DHL/FEDEX/UPS to U within 5-7days Delivery time: 20-25days Samples: sample fees and shipping fees paid by the buyer Shipping: Feature: Fashion and innovative design&unique style Micro paved, large size pendant with the back, good plating Best quality, provide QC team OEM service, after-sale service,QC team Quality Control: Professional technicians check every products in streanline Experienced jewelry workers examine each step of inlaying every stone Our techniacians check products again before packing Notice: the price on alibaba is only for referrence so it may be different from your order price Because price often varies due to many factors such as different material, exchange rate and so on please consult us for exact price, thank you for your understand Thank you for your attention, if any comments, pls contact us by calling/email / trade manager/ skype/ MSN or any way you like . 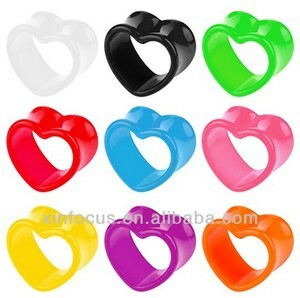 Alibaba.com offers 124 heart shaped tunnel plugs products. About 93% of these are body jewelry, 31% are stainless steel jewelry, and 20% are acrylic jewelry. 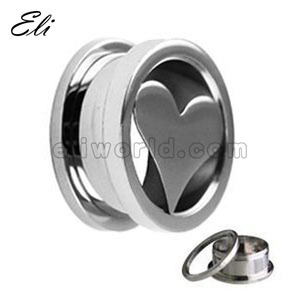 A wide variety of heart shaped tunnel plugs options are available to you, such as anniversary, engagement, and gift. You can also choose from children's, men's, and women's. As well as from stainless steel, acrylic, resin, lucite, and wood. 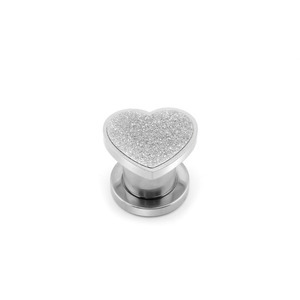 And whether heart shaped tunnel plugs is crystal, rhinestone, amethyst, or agate. 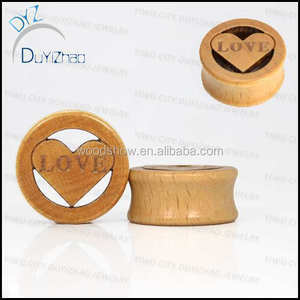 There are 124 heart shaped tunnel plugs suppliers, mainly located in Asia. 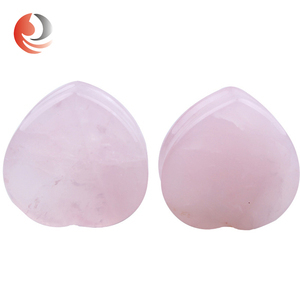 The top supplying country is China (Mainland), which supply 100% of heart shaped tunnel plugs respectively. 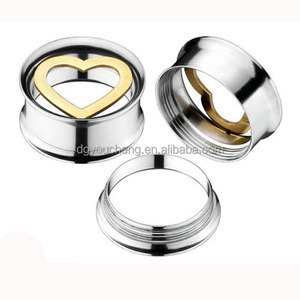 Heart shaped tunnel plugs products are most popular in North America, Western Europe, and South America. You can ensure product safety by selecting from certified suppliers, including 19 with Other, 2 with ISO9001, and 1 with BSCI certification.